I have the bad habit of turning on the stove to heat a pot of water for my coffee bod and then forgetting about it. When my glasses start to get misty, I look up from my computer and realize that it’s too late – I have to start the process over again, add more water to the pot and hopefully pay attention this time until it boils. The other day I saw a beautiful shiny kettle in a local island store and I asked the clerk if it was the whistling kind. She assured me it was and so I bought it, took it home, washed it out, and filled it with water. I admired it on the stove as I patiently waited for the moment when there would be enough escaping steam to start whistling, but it didn’t, not a peep. I dried it all off, repacked it in the box, found the receipt and drove back to the store and said I would like to return it because I wanted a whistler not a steamer. There was another shiny kettle on the shelf that the clerk promised me would steam. I received another receipt, another box, and the kettle. I drove home not quite as excited with my purchase as I was the first time, washed out the kettle, filled it with water, filed the receipt, flattened the box and waited for the whistle. It was a faint whistle, at best, but what the heck, it would have to do. The handle was awkwardly placed – definitely not designed by a woman – and as I wrapped my fingers around it and tipped the steaming kettle over the coffee bod the lid fell off and steamed the three fingers of my right hand. I had forgotten how painful first-degree burns can be. The next morning I looked balefully at the offending shiny kettle as it gleamed back at me while it sat on the stove, and decided I could not possibly take a second kettle back and face the same sales clerk again, even though she had been very pleasant. I just don’t like making a fuss. I would live with this kettle. Of course that meant I would always be checking to ensure that the lid was pushed in that extra little bit to make it stick – and putting up with a weak insipid little whistle. 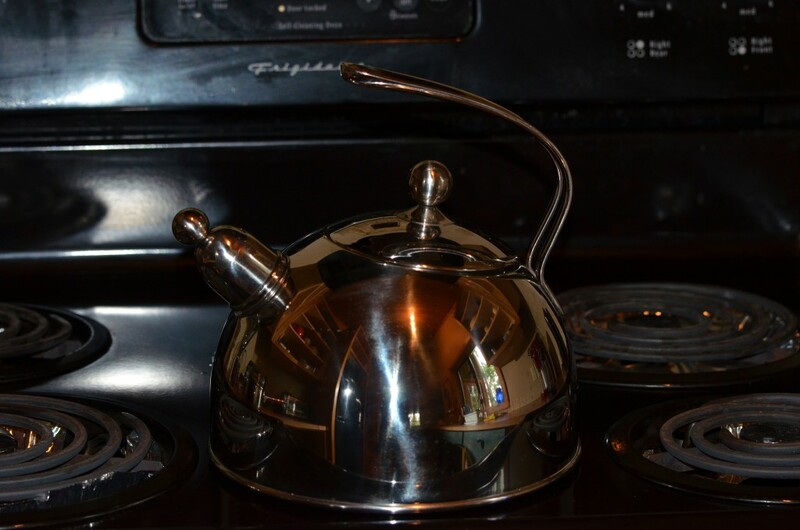 But as I continued to look at the kettle I realized I did not admire it anymore, that it would sit on the stove and stare at me, and I would stare back at it with distrust. So I packed it up and drove back to the store, and got a refund. A few days later, I noticed that the skin was starting to peel off my burned fingers but at least they no longer hurt. I am just glad as I stand by the stove and watch my little pot boil that I no longer have to worry about being steamed by a whistling kettle on a daily basis. Once again, it shows me that more times than not, that shiny expensive thingamajig that I think I need/want/must have is really a lot more trouble than it’s worth.